Doves are elegant, attractive birds with unique personalities that can be delightful backyard visitors, but despite their familiarity, birders might have some difficulties attracting doves if they aren't properly meeting these birds' needs. Fortunately, it is easy to adjust a birding station and habitat to be suitable for different types of doves. Doves are often welcome in yards and gardens because of their peaceful expressions, gentle cooing, and subtly beautiful plumage. Because doves can be tactile, they are often considered romantic and loving, and they can be helpful in the yard by cleaning up beneath seed feeders or feasting on weed seeds. Most doves are also year-round residents, making them familiar guests throughout the seasons even when other birds have migrated. Feral rock pigeons will also often visit yards, but many birders consider them less welcome because they are an invasive species and can deter native dove species from essential food, water, or shelter. As with attracting any specific bird species, it is necessary to understand the bird's exact needs and to take steps to meet those needs in the yard or garden. While there are many doves that will visit yards, their needs are similar and the same steps can result in a diverse dove population in any birder's yard. Food: Doves and pigeons are primarily granivorous, though some species, particularly in tropical regions, will also be somewhat frugivorous. Providing a range of grains is a sure way to attract doves, and they are partial to sunflower seeds, millet, milo, cracked corn, and wheat. Because these are larger birds, they prefer feeding on the ground or using large, stable tray or platform feeders that have adequate room to perch. Swinging or hanging feeders are less appealing to doves, though they may try to balance occasionally. Planting native seed-bearing flowers for birds can also provide a ready food source for doves, and berry bushes are another great option. Water: All birds need water, and doves will travel great distances to visit favored watering holes. While these are larger birds, they prefer shallow baths, streams, or even puddles, especially where bare, tapering edges allow plenty of space to approach the water. Positioning sprinklers to keep a bird bath full or create regular puddles can help give doves a suitable water source, but water should always be kept fresh and clean for their use. Shelter: These birds will roost in snags, bare trees, or coniferous trees, and an open brush pile can be a useful substitute if there are no trees nearby. The trees should be relatively accessible and without a thick tangle of branches, so some minor pruning may be necessary to attract more doves. Nesting Sites: Most doves craft relatively flimsy, messy nests on stable platforms, such as in the crook of a tree, on a window ledge, or even under an eave or awning. Providing nesting material such as small sticks, twigs, pine needles, and grasses will help encourage doves to nest, and they are prone to nest throughout the year whenever conditions are favorable for raising chicks. While it can be very enjoyable to attract doves, birders should be aware that large flocks of doves can become bullies and their hearty appetites can quickly drain feeders. If doves become a problem, taking steps to discourage rock pigeons will be effective against most dove species without harming the birds or keeping other species away. Even with the best intentions, it can be a challenge to attract doves to the yard, particularly in more populous areas. 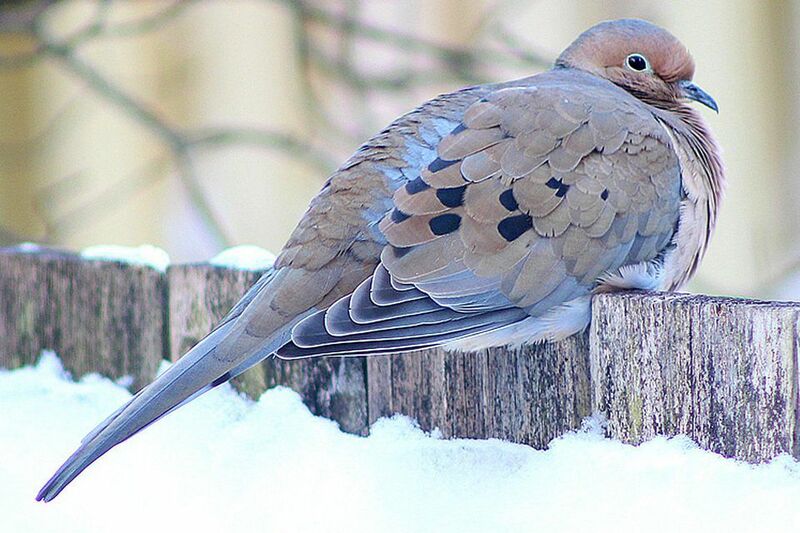 These can be shy birds, and birders who have already taken steps to make their yard dove-friendly can further encourage these birds to visit with a little extra effort. Allow seed to spill on the ground below feeders or establishing a ground feeding area, but still keep it clean of excessive hulls and feces that may spread diseases. Provide a dusting or sunning area for doves to use, such as a wide deck railing or a bare patch of ground in a quiet place where they can feel secure. Discourage feral cats and other predators that may prey on doves, and take steps to protect backyard birds from hawks. Leave snags, clotheslines, wires, and similar perches available for doves to use, including unpruned, protruding branches on backyard trees. Provide sand or small bits of gravel for doves to ingest as grit to smooth their digestion, and provide calcium in the spring for nesting birds to take. Attracting doves is as easy as meeting their specialized needs and understanding their preferences, and birders who do both will soon be enjoying their own dove flocks as daily guests. Yes, You Can Attract New Bird Species to Your Backyard! What is the Best Way to Attract Swallows? Tips to Attract Winter Finches - Redpolls, Crossbills and More!